Slate remains a popular choice in roofing materials due to its superior strength and beauty. Its long service life allows it to keep its beauty and functionality for years. Slate’s high upfront cost, however, discourages homeowners from selecting it as their roofing material. 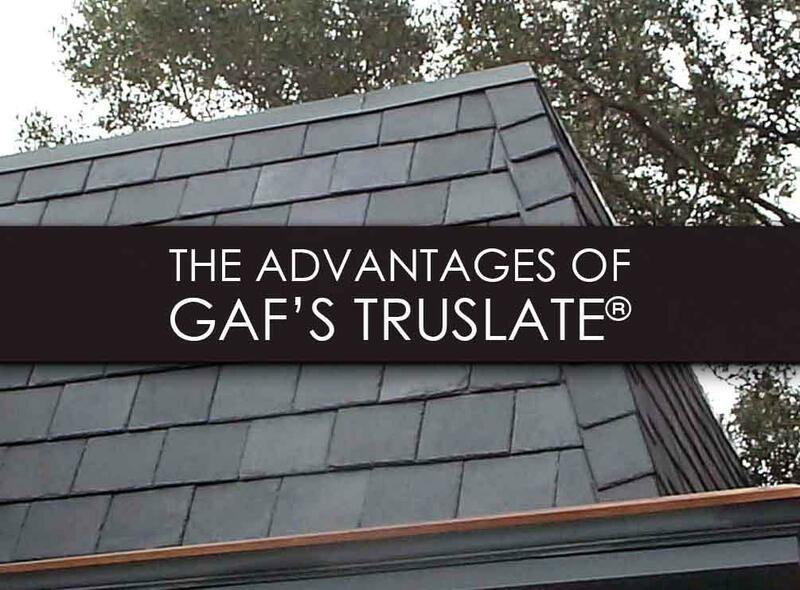 As one of the leading innovators in the roofing industry, GAF has come up with their TruSlate® Premium Roofing System. This allows you to enjoy the benefits of authentic slate at an affordable price. As a GAF Master Elite™ roofer, Tedrick’s Roofing can offer you this exclusive material. Let us discuss their different advantages. Similar to slate, TruSlate offers excellent durability. It will not curl and warp and offers great resistance against mold growth. TruSlate can also withstand extreme weather conditions and resist high wind speeds. This way, you won’t have to worry about constant maintenance to maintain your roof’s beauty. As a waterproof and non-combustible material, you also don’t have to worry about leaks. TruSlate can last for up to 100 years, lessening the need for costly replacements. TruSlate features a ridge vent that offers excellent insulation. By removing excess heat and moisture from your attic, it can help keep your home’s comfort levels high. This leads to lesser strain on your heating and cooling appliances, which reduces your energy bills. As your trusted roofing contractor, we recommend this system because it comes with a unique Underblock™ UV and Moisture barrier. This significantly increases your roof’s protection against the harsh elements all year long. TruSlate comes in a range of classic colors that can boost your home’s curb appeal. Since they are made from natural stone, each slate has a unique color. Over time, they fade to bring out their true beauty. This creates a wonderfully appealing mix of colors on your roofing system that greatly improves your home’s beauty. When it comes to GAF’s TruSlate, it’s best to turn to a certified roofer like us. We can ensure the expert installation of your new roof, allowing superior protection for years. We can also handle roof leak, cleaning, and emergency repairs. When it comes to quality services, Tedrick’s Roofing is a name that you can trust. Call us today at (877) 212-9355 or (253) 499-9660 to request a free estimate. We can help homeowners in Auburn and the surrounding areas in WA.